This post is part of our OWNER’S MANUAL for DIGITAL MARKETING series – a guide for small business. Today, we’re going to look at some hard numbers. To calculate the ROI of SEO from multiple angles. We’ll start by looking at click-through rates for each of the top 20 positions in Google. So you can estimate the increase in website traffic you’d gain from a first page Google ranking. We’ll look at the value of SEO-generated traffic compared to the cost for the same amount of paid traffic. And finally, we will look at ROI. And give you a formula to calculate the ROI of SEO for yourself or for your clients. How much traffic could I get if I made it to the first page of Google? How much traffic could I get if I was ranked number one? Is SEO worth the time or investment? Would SEO actually pay for itself? You’ll want to read this guide. I set out on a quest to discover what really happens on the first page of Google. To understand who gets clicked on. To understand the value of a first place organic ranking. A third place ranking… or a 7th place ranking. I was looking for a good, comprehensive and current research study outlining the click-through rates (CTR) for each position in Google. I read dozens of articles and research reports highlighting first page of Google statistics. What exactly is click-through rate, and how is it calculated? CTR is the number of clicks received compared to the number of times a link to your site is seen in Google. It’s important to note that the user must visit the page on which your link resides to see an impression. So, if you are ranked on page two, but the user never scrolls past page one in Google, the impression is not counted. Here’s an example CTR calculation: If you had 200 impressions, and you received 10 clicks, your CTR would be 5%. Click-through rate is calculated for every single keyword, and is shown in Google Search Console reports. It’s a very important metric to track in search engine optimization and critical for estimating SEO ROI. Several studies have been done, using different methods to measure estimated CTR by search engine position. AOL was one of the first, releasing data in 2006 that showed – a number one position in AOL gained 42.3% of all click-throughs. Several more CTR studies have been done in subsequent years. The best study I’ve found is one that’s constantly updated with fresh data each month. I discovered it while reading an article from Smart Insights about organic click through rates by search engine position. It’s called the Google Organic CTR Study by Advanced Web Ranking. From May of 2014 through today, Advanced Web Ranking has shared CTR data from a log of click-through rates it keeps for subscribers of its keyword ranking tools. This study is ongoing. Current data for the CTR study measures over 1,800,000 keywords pointing to 53,600 different websites. The CTR study shows a history of Google organic click-through rates and how they have evolved over time. And it breaks information down by device type, business category, search intent, keyword length, etc. The study shares statistics about each position on the first page of Google, the second page of Google, and the top position (number 21) on the third page of Google. Today, we are are looking primarily at the CTR for “Unbranded” keywords. Unbranded keyword searches do not include the business name in the search term. This data set eliminates skewed results from people specifically searching for a business name and subsequently clicking the first result. For example… A branded search term would be “Visigility”. While an unbranded search term would be “digital marketing tulsa“. Check out the difference between branded and unbranded CTR. So to help you understand how much SEO could help increase traffic to your website, let’s look at the click-through rates for each of the top 20 spots on Google. As you can see from the chart, there is a reason why Google’s number one spot is so highly prized. The increased website traffic potential is huge with each SEO-driven boost in ranking. Your website is currently ranked for a keyword that gets 300 searches each month in Google. But, it’s ranked on page two at position #15. Your listing may only be seen by a fraction of the 300 people searching for your keyword. Some studies estimate 75% of Google users don’t go beyond the first page of search engine results. 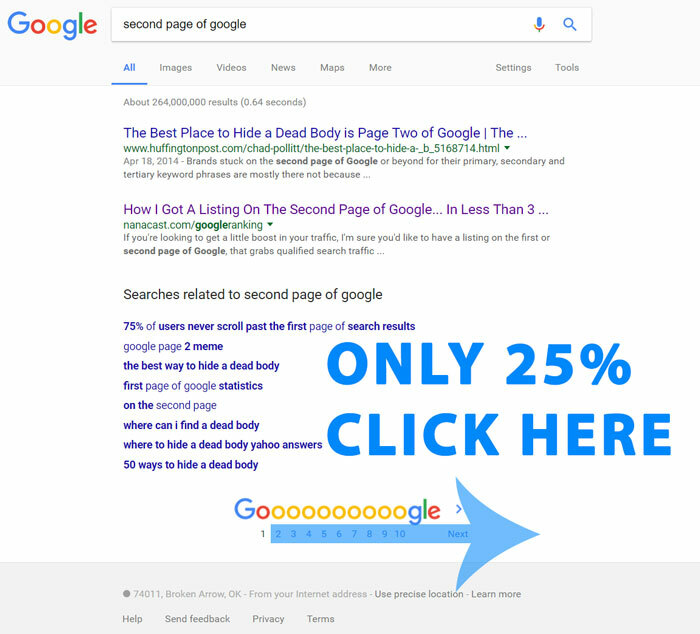 Leaving only 25% of searchers that actually visit the second page. According to the chart above, (at position #15) you can expect to receive a click-through rate of 0.65% for people who see an impression of your listing. So, for a keyword that gets 300 searches per month, at position #15, you can expect approximately 1/2 of a click per month. Yes, you read that right – one half of one click per month. What if some basic website SEO helped boost your ranking to #10 in Google? Moving up 5 spots from #15 to #10 yields a 684% increase in website traffic. What if some aggressive website SEO helped you rank first in Google? Here’s how it would pay off. Moving up 10 spots from #15 to #1 yields a 15,684% increase in traffic. That’s just looking at one keyword phrase. 77 Clicks per month from one keyword isn’t too bad. What if SEO delivered multiple keyword rankings? You rank for 20 keywords that each get 300 searches per month. In total, the number of monthly searches for your keywords are 6,000. …you could expect at least 334 visitors per month to your website – from organic Google traffic. For this estimate, I’m using the CTR for position #3. Although, some of your rankings could be higher. If you have a few higher ranked keywords, then you’d likely get more clicks. In truth, when SEO helps you rank for 20 keywords in the top 3 positions in Google, you will also rank for hundreds of additional keywords in varying positions on the first several pages of Google. And though these additional keywords may be ranked lower than the top 3 in Google – in total, they will deliver several more clicks themselves. To estimate how much traffic you might gain by using SEO to get your website on the first page of Google, you need to do a little research. You need to know how many searches per month are performed in Google for your target keywords. You can find the estimated number of monthly searches for your keyword by using the Google Keyword Planner. Fortunately, several people have already written good tutorials on how to use the Keyword Planner for research. Here’s a great guide on how to use the Google Keyword Planner. Next, let’s look at the SEO value of all this extra traffic. We’re going to look at two different models to estimate the value of SEO. …to help evaluate if SEO is worth the cost or time investment to boost rankings. If you advertise with Google AdWords (or some other type of paid search advertising), you will generally pay per click or impression. You pay to put your listing near the top of Google, and the listing is marked with an “Ad” icon. With good SEO, your search engine listings appear in the natural search results below the ad. And you get free organic traffic from Google. It’s great to be listed near the top of Google in natural (organic) listings. Does it get you more traffic. But it also boosts your credibility. It increases the authority of your business. And makes you the go-to source in your industry. If you pay per click, you pay each time a Google searcher clicks on your ad. These clicks can range from a few cents to several dollars per click. According to a recent WordStream study, the average cost per click (CPC) across 20 major industries is about $2.32. This is average, though several competitive keywords can easily cost in the range of $50 or $60 per click (even in Tulsa). “Best Mesothelioma Lawyer” ran $935.71 per click in 2016. The chart below shows how many clicks you might expect from a solid #1 position, along with the related cost you would pay for those clicks for varying levels of CPC ad rates. If you are targeting search terms that total 1,500 searches per month. You could normally expect 387 clicks from being first in Google. The same 387 clicks would cost $1,160 at $3.00 per click. The SEO value of a number one position goes up significantly if you are paying for more competitive keywords. As you can see from the chart – if you are spending $15.00 per click, the same 387 clicks would cost $5,801. If you want to run a deeper SEO ROI analysis (using current Google Search Console search analytics) to determine the PPC value of your current organic traffic, take a look at this. Return On Investment is a calculation that illustrates what you gain as a result of what you invest. How do you measure the ROI of SEO? Your “Gain” is the Lifetime Value (LTV) of a new customer. Your “Cost” is the Customer Acquisition Cost (CAC) – or the cost to acquire a new customer. Simply put, LTV is an estimate of lifetime gross profit earned from each new customer, including future business. Plug in your own numbers to calculate LTV. And your customer spends on average $80 per month for services and chemicals to maintain their pool. You deliver excellent customer service, so you can expect the average customer to stay with you for 5 years. And, your gross profit margin runs about 38%. Next, we’ll look at the SEO customer acquisition cost to gain a new customer. How do you calculate CAC? Customer Acquisition Cost is a metric that helps business owners know how much it costs to get a new customer. It’s helpful to keep track of CAC for different types of marketing or promotional activities. And what offers the best bang for your buck – the best ROI. In this case – you might have one CAC associated with billboard advertising and a different CAC associated with SEO. Complete or “fully-loaded” CAC goes beyond obvious promotional investments in advertising, AdWords, SEO, social media advertising, and social media management. Complete customer acquisition cost may also include the rest of “what it takes” to get a new customer. Expenses like: sales commissions, sales and marketing staff salaries, business expenses associated with sales and marketing, etc. For our purposes (calculating the ROI of SEO), we are looking at a simplified version of CAC, so it’s easy to compare SEO to other marketing channels. Customer Acquisition Costs vary widely by industry. If your LTV is $1,824 (as shown in the pool company example), you might be willing to shoulder an CAC of $200 – $300 (or more) to gain a new client. Your marketing budget may allow more tolerance for a higher Customer Acquisition Cost initially because typically the CAC associated with SEO drops over time as rankings improve. The value of a new client often extends beyond the LTV of that one customer. Sometimes they bring referrals or offer a review or do other things to add value (or more revenue) to your business. The CAC formula is very simple. What’s harder is determining which leads and new customers actually come through SEO efforts. How do you know if a new customer was gained through SEO? As with other types of marketing – when it comes to SEO – it’s sometimes difficult to correlate SEO efforts as the lead source for a later customer purchase. As buyers become more sophisticated with how they research products and companies, the exact path a person takes from – Discovery “first exposure” to your company to Purchase “become a customer” of your product – becomes harder to pin down. Customer journeys are rarely linear. And SEO affects research, discovery, and trust-building… very early steps in the purchase process. Jim just moved into a house that has a pool. He goes to Google and begins searching things like, “how to maintain a pool” or “pool maintenance schedule”. He clicks a link to your website and reads an article on your blog. So he reads some more. He also visits a few other website to see what other companies have to teach him about pool maintenance. Or maybe he picks up the phone and calls you. Or maybe he visits your Facebook page and sends you a message. Or maybe he emails a link to himself to contact you at a later date. Or maybe he fills out the form on your website. Unless your business is entirely online…. The best thing to do is just ask how they first learned about your company. Getting to the first page of Google with SEO takes time. Sometimes months depending on the keyword you are targeting. And getting to the number spot in Google is even harder. In some industries, companies are pouring thousands of dollars each month into SEO to improve website rankings for competitive keywords. Increased website traffic means increased business. The rewards (most of these companies have decided) are worth it. Hopefully, this guide has given you a better understanding of the potential traffic that lies on the first page of Google. Leave me a quick comment below.